Today is the day! The Aussie Blog Awards in association with Her.ie is on tonight and I am so excited! This is the first bloggers award event I have been to and my blog has been nominated for Most Aussome Newcomer and Reader’s Choice!! So what have I done to prepare for the evening…. Despite the Irish heatwave that hit us last week I unfortunately do not tan, instead I go a lovely shade of pink or develop a few freckles which I ‘claim’ to be my tan! So while I opted out for hours spent sunbathing I decided to fake it for the evening. 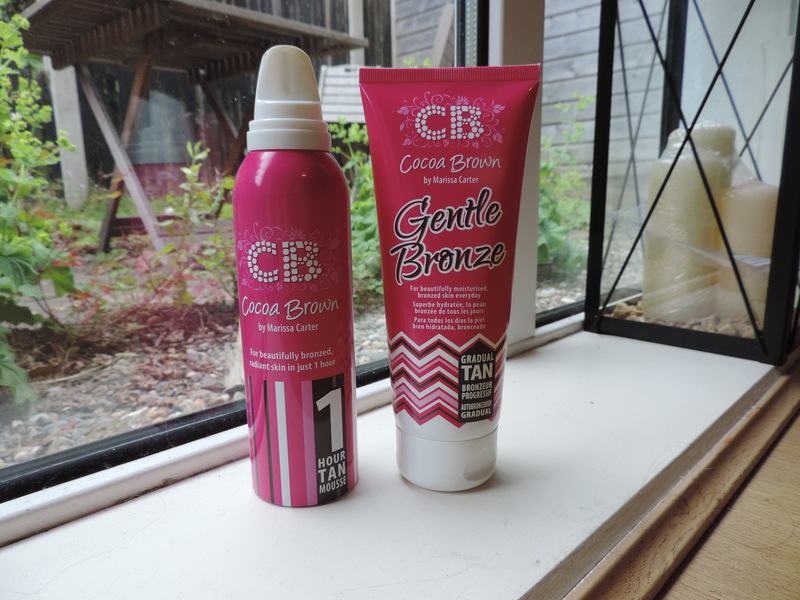 I used Cocoa Brown’s famous and totally reliable 1 Hour Tan on Saturday night then this morning I applied a layer of Cocoa Brown’s Gentle Bronze which is a gradual tanner. I had a base tan from Saturday night but I wanted to add and extra bit of glow to my legs for the occasion. This tan took me 5 minutes to apply and dried by the time my breakfast was cooked and eaten. I used a mitt to apply because I was afraid of ending up with patching hands which is never a good look and I am not to sure that I could pull off that look! Gentle Bronze is a gradual tanner and acts as a moisturiser. The tan itself is tinted so you can see where you are applying the tan. To me this is very important in a tan as often when you cannot see what you are doing you can go a little bit over board, no one wants to be orange! 4: Tanning is a chore and ends with streaks or white patches! Now onto my hair. Remember when you were 15/16 and everyone was going through the phase of wanting to go blonde or else getting blonde streaky highlights? Well I wasn’t allowed so much to the point my mum told my hairdresser that she was under strict instructions not to EVER colour my hair! Everytime someone asks me have I ever coloured my hair I think back to that moment and I thank my mum! Instead what she did was she got me clip in extensions. Back then they were probably a lot more expensive than they are now but my mum is a wise woman and knew I wouldn’t stop with wanting to go blonde. I would share a photo of how they looked but I am completely ashamed and embarrassed with how cool I thought I was! Oh the things we do when we are young!! This morning I washed my hair with Kerastase Specifique ‘Bain Exfoliant Purifiant’. I suffer every now and again with dry scalp and this shampoo is my savior when it gets bad. The formula of the shampoo is developed with micro-beads to help give an immediate “clean scalp” feeling. I use this shampoo normally every second wash and alter between my normal shampoos then. I am always changing shampoo as I love the different smells they have but I have to say I stick to what I know with my conditioners. 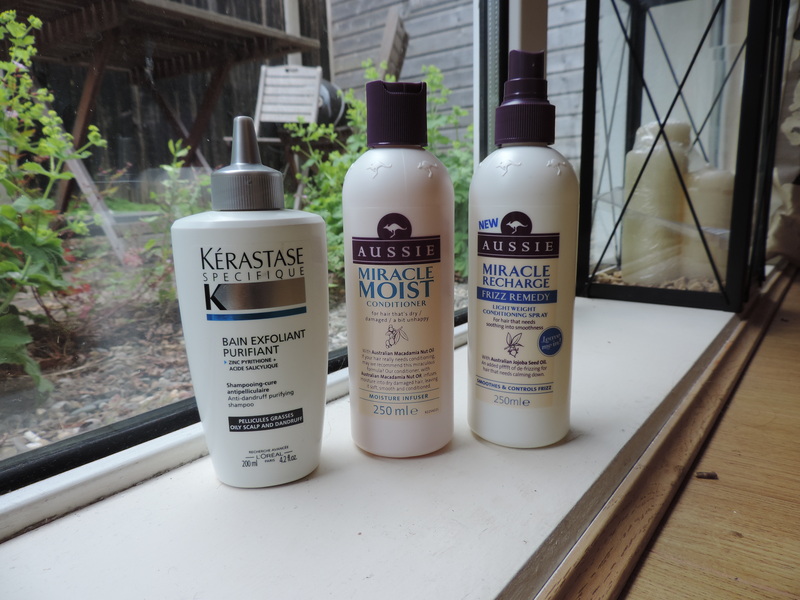 I used Aussie ‘Miracle Moist’ conditioner everyday as I find it really does protect the ends of your hair. As most girls do I am always curling or straightening my hair which can have huge damaging effects! Your hair is so important and defines you and your style so I always take good care of my hair. My hair also always has tangles in it after the shower so on top of my conditioner every second day I apply Aussie’s ‘Miracle Recharge Frizz Remedy’ conditioning spray. My housemate has fabulous blonde curly hair and find this product brilliant for her hair as it makes her hair really smooth for brushing. So anyone else with serious curly hair take note! I often use hair masques too and I LOVE Espa’s ‘Pink Hair & Scalp Mud’. This is an ultimate treat and I always borrow my mums jar but the smell of this product is divine and the smooth silky texture it leave your hair is worth every penny! In being honest anything Espa is divine! Tonight as per most nights I am curling my hair. I am lucky that I have thick hair as it holds curls in extremely well. 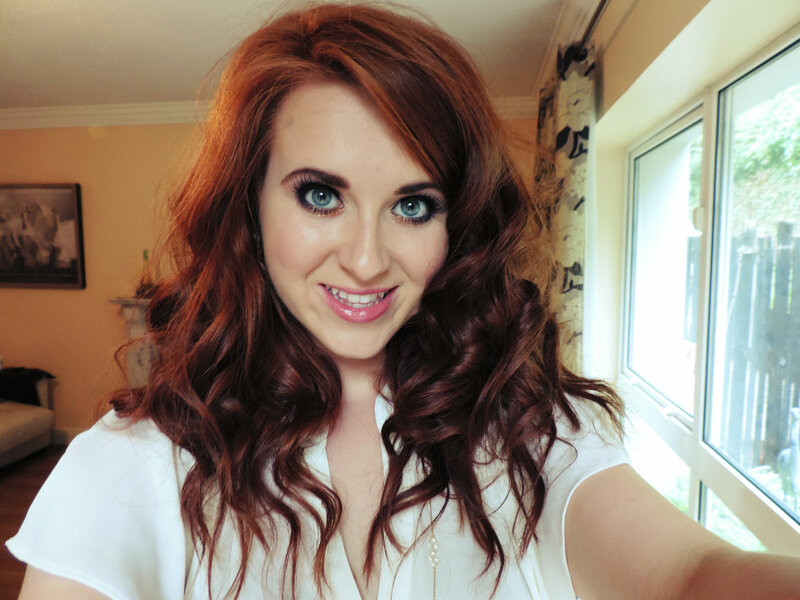 I use a BaByliss curling wand and I cannot live without it! I have had this curler for about 4 years or so and it is perfect! It is a thin wand so it creates tight curls but if you want looser curls I find if you just play around and twist the hair looser around the wand this works. This curler is great for creating different looks and is very versatile. My advice some evening that you are at home and staying in play around and see the different styles of curls you can create! Now onto my makeup for the evening! As this event is starting early evening I am not going to go too dark with my makeup and of course any evening look would not be completed without eyelashes. I love the feeling of wearing eyelashes, they are so girly and they make me feel super dressed up! Will have full post later on in the week of the event itself! Posted in Blog Awards, Hair, TanTagged Aussie Blog Awards, Babyliss, Cocoa Brown, Cocoa Brown Tan, Conditioner, Espa, Gentle Bronze Tan, Gradual Tanner, Her.ie, ShampooBookmark the permalink.